* $25 + gst is the monthly cost if your prepaying annually in advance ($300 + gst per year). If you are paying on a month by month basis, the monthly fee will be $26.67+gst. 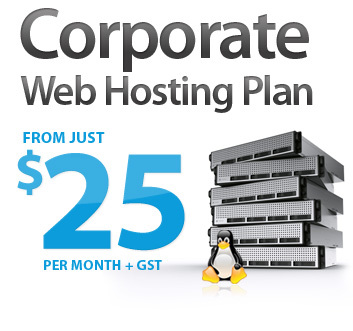 Our Corporate Web Hosting Plan is the Ultimate of New Zealand Web Hosting plans. This is one of the Best Value Hosting Plans you will find anywhere in New Zealand, for Real New Zealand Web Hosting on a Genuine New Zealand Based Web Server Network. Our Corporate Web Plan also comes with a Hosting Control Panel, that has been developed here in New Zealand, and it has been purpose built for for this particular hosting network. The Control Panel allows clients to manage all aspects of their website hosting & email in real-time, using just their web browser. To view screen-shots and of the Hosting Control Panel, please click here. Single Website Hosting Plan, with the ability to point five different domain names to your website. This New Zealand Website hosting also comes with a Hosting Management Console, that has been developed here in New Zealand. The console allows clients to manage all aspects of their website hosting & email in real-time, using just their web browser. To view screen-shots and of the Hosting Management Console, please click here. The linux servers will support most popular open source software packages, such as Silverstripe, Wordpress, Joomla, OS Commerce, Zen cart, Interspire Shopping Cart, plus many more etc. Need more server resources? We have the following range of server resource packs available for purchase as addons for our Corporate web hosting plan. These packs are in addition to the resource quotas that are included as standard with the hosting plan. More than 99% of websites hosted on our network do not need to buy these resource packs, as those websites are easily accommodated within the standard quotas. It is only the high resource websites (the 1% of top users on the network) that may need to purchase additional resource packs. More details and FAQs on our resource packs can be found here. If your website has high traffic requirements, please email us with your websites details, including current or expected bandwidth usage. When the user first logs into the Hosting Control Panel, an Introduction Screen describes the basic aspects of the control panel and how to use it. Users are able to set the Account Overview page, to become the default page that is displayed when the user first logs into the control panel. Using the Quick Add feature users can set up Domains, mailboxes, databases and much more. The console comes with it's own built in knowledge base, where many answers to popular questions can be found. It also contains details to standard server settings. Create mailboxes and attach email addresses to them, or forward addresses on to external mailboxes, or multiple recipients. Setup email addresses, auto responders, and anti spam settings, for each mailbox. Using scheduled auto-responders you can set 'away' messages so when you're away from the office people emailing you will get an auto-response with your specified 'away' message. As well as using your regular email client to retrieve your email, you can also retrieve your email anywhere in the world by using webmail. From within webmail, you can do most things that you can do within your regular email client software, including composing and sending emails, and receiving your emails. Above is the webmail inbox. Webmail includes either an HTML email editor, or a plain text email editor. Webmail also includes a built in Calender, where you can enter dates and events. View detailed statistics for you website via your web browser. Manage your MYSQL databases through the phpMyAdmin web based console. High Volume website's whose bandwidth usage becomes excessive and uneconomical and/or impractable for us to host on a shared server environment, will be contacted by us. In the event we require you to move from a shared hosting account, we will discuss the options available to you, which may include hosting on virtual servers, or dedicated server hosting. What constitutes excessive bandwidth usage is decided by our upstream providers. Please be sure to email us us if you expect your website to have high traffic requirements, or if you are planning on switching a high bandwidth website to this hosting plan. You can only signup to this hosting plan, if you agree to setup and pay by monthly automatic payments. Details on how to setup automatic payments can be found by clicking here. Cheque payments are not permitted with this hosting plan.